What was the Inspiration for your wedding day? The backdrop of Big Sur and the Pacific coastline is just so stunning that I wanted that to be a focal point and inspiration. When we first drove down 101, I knew this place was unique. It’s one of those sights that is so awe-inspiring that you have to take a moment to stop and just stare at it. I wanted that beauty to be a part of my wedding! How and why did you pick your venue and or wedding details? There are so many great venues in Big Sur and Monterey, but Rocky Point was the one that I instantly loved. 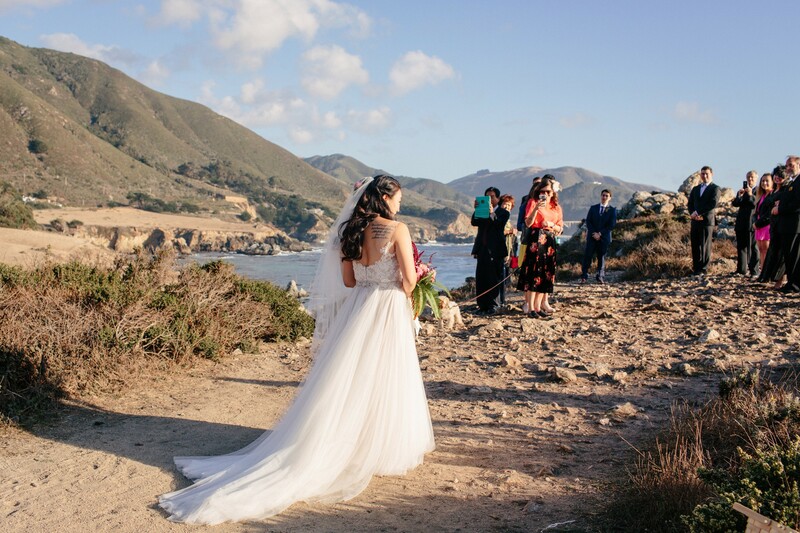 Everywhere you look, there was something beautiful to see– the crashing waves and rocky cliffs, the open sky, the rolling brush-filled hills, and the iconic Bixby Bridge are all within view! We also decided to have our first-look and get ready at Glen Oaks in Big Sur. The river and particularly the Redwood forests are also so magical and full of history, that it felt really special to be able to surround ourselves with that beautiful, quiet, and natural environment on our wedding day. What special details did you include in your wedding or reception?? We chose to do a oathing stone ceremony as part of our small ceremony. Since we had such a small guest list, we wanted to include everyone in our ceremony somehow. A ring-warming was our first plan, but we are standing on a cliff next to the ocean! If someone dropped the rings, they’d roll right into the ocean! We read about the oathing ceremony and it just seemed right. We chose our stone the morning of the ceremony from the Big Sur River and everyone was able to impart their good wishes into it for us. They say a promise made in stone is forever, and we swore our wedding oaths while holding the stone. Our oath stone is now in our bedroom, on our dresser. It’ll stay with us through the years as we move and grow! How did you make your wedding day special and make it about the two of you??! I think one of the most important things we did was to keep it really small. We got to spend a lot of time with all of our guests and it felt really intimate. The other thing was to make sure to set aside some time for us. One of the most special parts of the day was the picnic for just the two of us after the ceremony while our guests had some cocktails. We had first planned to elope, but decided at the 11th hour to invite some guests! We kept the picnic from our original elopement plans so we had a chance to watch the sunset, drink some bubbly, and share a sweet treat as husband and wife for the first time. It was so wonderful to have a quiet moment alone during the exciting day! Any advice for those planning now? Don’t sweat the small stuff! I agonized over each little detail, spent so much time picking out place cards, lighting/ candles, and looking for the perfect belt, the perfect earrings, etc., but all of that just ended up being background noise during the actual day. I must have spent hours worrying about the favor boxes, and literally they were just handed out as an after-thought at the end of the night! Also, wear comfy shoes! I ended up wearing Keds since I was climbing up and down rocks, but it was a godsend to not have painful feet distracting me during the day. How was your experience working with The DeLauras?? We had a wonderful time working with you two! We could tell how much photography excites you and how much you loved the scenery and beauty around us too and that made me feel more relaxed! Thank you, thank you, thank you for everything! !